I always like looking at these miniature villages at Christmas. Our local garden centre seems to specialise in these displays, they are all,lit up with moving parts, quite fascinating to look at. You can buy the little houses, churches etc that make up the display, looks fabulous here but it would cost an arm & a leg to buy all this! 1. Pottering around shops in Garstang & surrounding area, seeing people we knew & having coffee & toasted teacake. 2. Buying the perfect present to take to our new neighbours tomorrow at their mulled wine afternoon. A small rooted Christmas tree with sparkles on it in a very pretty box. The first thing to plant in their bare garden to be! 3. Looking through windows at beautifully lit Christmas trees. I don't have a spare arm or leg, so will content myself with this photo! Amazing - someone must have created all these! Christmas is a lovely time to stop and chat and wish a merry christmas! Doesn't happen afterwards! The snow villages are so popular here, they are beautiful! This looks gorgeous on black! Fav. A huge amount of work in all of this. I have never seen one! @quietpurplehaze This is only one display Hazel, there are several set up, they have them every year. @quietpurplehaze the display in the garden centre was enormous as usual. So much work setting up all the hundreds of trees & decoration displays, I think they start in August. Don't actually think they sell much stuff, people look & marvel but there is a limit to how much you put on s tree! @gijsje bthank you Bep, appreciated. @jesperani tagged Jennifer thank you. @louannwarren. They do look lovely with them all lit up, moving parts too such as trains. 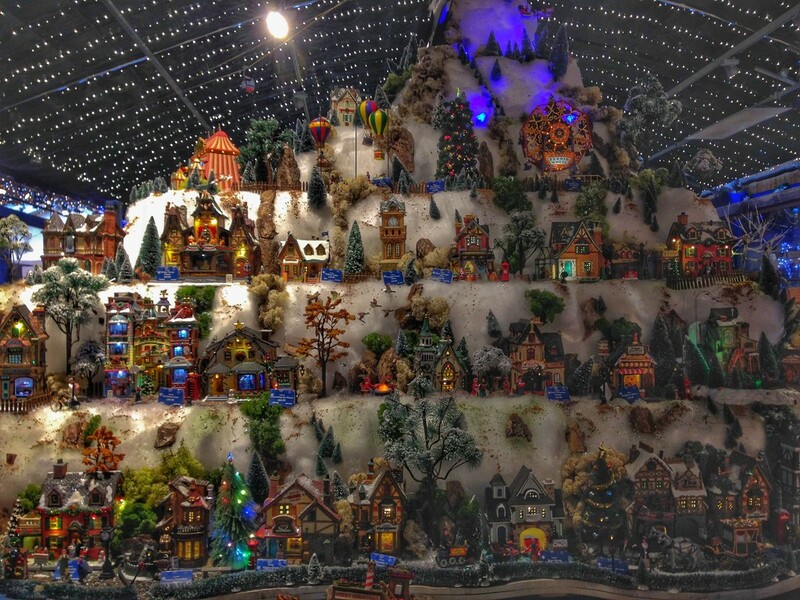 What a gorgeous display of the snow village -- I could stand and stare at this display for ages -- such festive image ! @maggiemae Yes I do love the festive season but as soon as it's over so glad to move on. Not long now, you will be getting excited! @beryl Yes it was mesmerising Beryl! Wow that is so impressive!! Love it! Wow... what a great display. Wow Pat this looks amazing. What a great display. Very beautiful display. My next door neighbour every year sets up a winter scene during Christmas with miniatures like these and it is so beautiful to see.